If Manchester City were to sign an 18-year-old talent normally, he would be sent the prestigious City Football Academy and brought up through the ranks, or possibly loaned abroad. But if 18-year-old AC Milan goalkeeper, Gianluigi Donnarumma, was to arrive at the Etihad, he’d almost certainly be thrown straight into the first-team, such is his enormous reputation already. The Italian international is widely considered to be the best teenage goalkeeper in the world and according to Marco Nosotti of Sky Italia, Manchester City have a ‘blank contract’ ready for the wonderkid, who also has the eyes of Juventus and Chelsea in him. 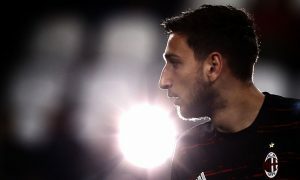 Donnarumma is currently engaged in something of a stalemate with Milan over a new contract, no surprise considering his agent is Mino Raiola who will always look for the best possible deal (and pay-day for himself). Speaking live on Sky Italia, Nosotti said that Pep Guardiola is a big fan of Donnarumma and would love to sign him, while Chelsea could also make a play for him if Thibaut Courtois was to leave Stamford Bridge in the summer. Milan would hope to earn at least €100 million from the sale of a goalkeeper who could offer as much as 20 years of service to his club. Another Sky Italia journalist, Alessandro Alciato, claimed back in November that City had already taken ‘important steps’ to securing Donnarumma’s signature. City are quite likely to invest in a new goalkeeper for next season, with Joe Hart on the way out and Claudio Bravo a major disappointment and now second-choice behind fellow veteran, Willy Caballero. While Donnarumma and Jordan Pickford of Sunderland have both been linked, the consensus in the press is that Benfica’s Ederson Moraes is City’s main goalkeeping target.